Walt Elias Disney, better known as Walt Disney, was born on December 5, 1901 in Chicago, Illinois to Irish-Canadian father, Elias Disney, and German and English mother, Flora Call Disney. Walt Disney grew up in the Hermosa neighborhood of Chicago, with three brothers and one sister. He is regarded as an international icon and has contributed to the world as an entrepreneur, screenwriter, director, producer, cartoonist, animator and much more. 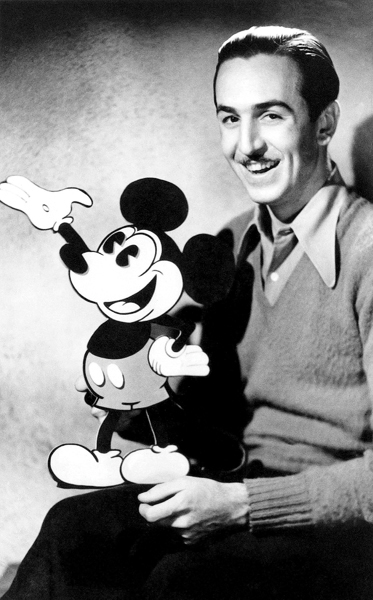 With the collaboration with his broth Roy Disney, Walt Disney Productions became known as the best-known motion picture production worldwide. His accomplishments include: 22 Academy Awards, 4 honorary Academy Awards (59 nominations total, with record setting four in a single year), rewarding him more nominations an awards that any other individual in time, as well as seven Emmy Awards, two theme parks (Disneyland, Walt Disney World Resort) as well as international resorts as well (Tokyo, Paris and Hong Kong). Unfortunately, after a long struggle with lung cancer he passed away on December 15, 1966 in Burbank, California. Take a look at some of our library materials about Walt Disney. Thank you for writing about Walt Disney’s birthday. He was one of the great family men of all times.